My sister and I are long time New Yorker readers. Recently we have added more of it to our world: the daily calendar of great old covers, the daily email articles and now New Yorker radio hour. There is nothing I enjoy more than listening to good radio while I am hooking on my big rug. I’m an avid follower of Serial — listened to season one in under a week once I discovered it–but for season two there is a two-week wait between episodes. Welcome Nyer radio. It’s weekly and has about five pieces in each episode. Great informative listening. 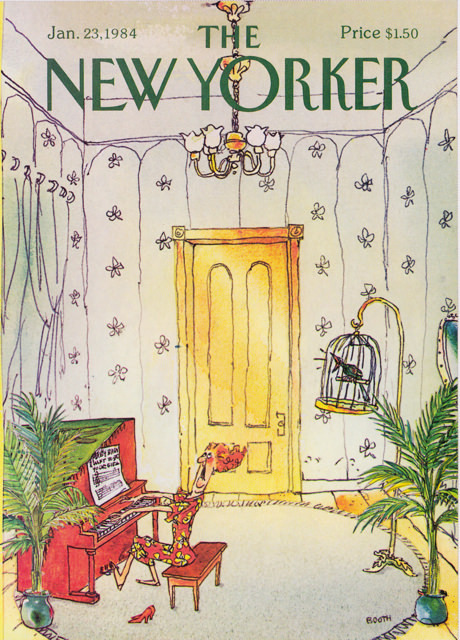 But back to the covers…the other day my sister wrote to me about Friday’s cover, the inimitable George Booth’s 1984 red head at the piano, below. We both love George Booth, especially his wonderful dogs. The Radio Hour just had an interview with him–he is now 90– and that took me to this article from 2014, Beware of the Dog with some of his best covers. my all-time favourite leading off. I hope you will check out the links, and tune into New Yorker radio hour. You are in for a treat. Here is where I was when I last posted in the summer and the two photos here show today. There is still a way to go, but in the spirit of Annie Liebovitz, I’m sticking with it. 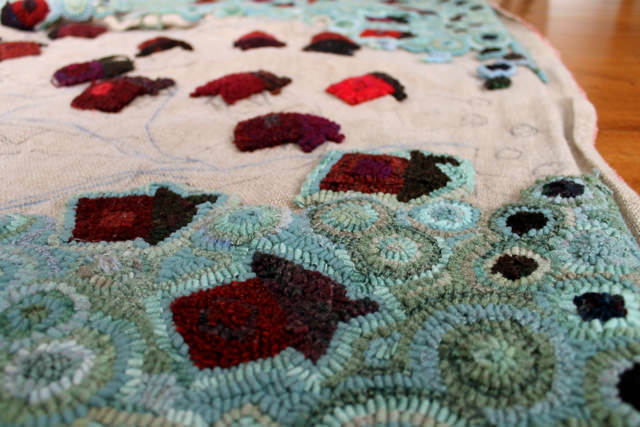 I’m not taking this rug out to hooking gatherings anymore–much too unwieldy. But it’s still a great joy to have her on the stand and to pull the loops and join the circles. Kind of like living. Sticking with it and getting stronger. Here, finally, is a 1510 backpack ready for the on-line store. I first designed this bag with one of the favourite young women in my life and since then have made four for order. 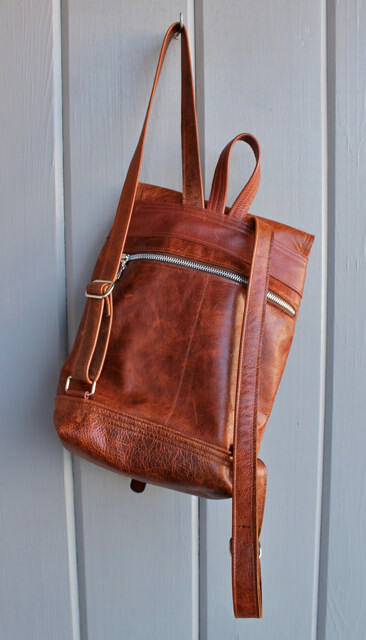 The design gives a nod to the classic backpack but has its own personality. 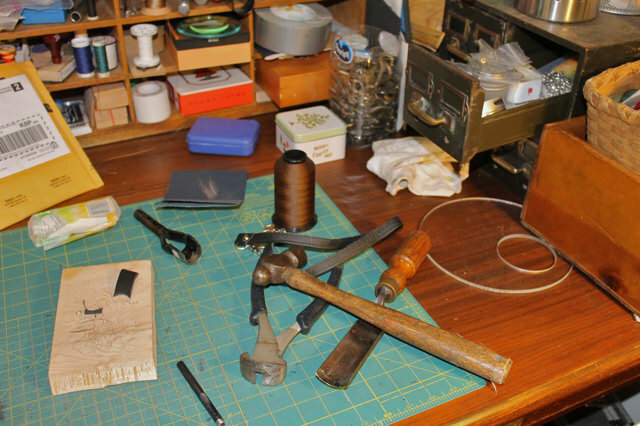 Each 1510 has had refinements; it’s the great thing about remaking a design. And what started out as a request to use a favourite belt has become a search for vintage pieces to use as a signature closure. 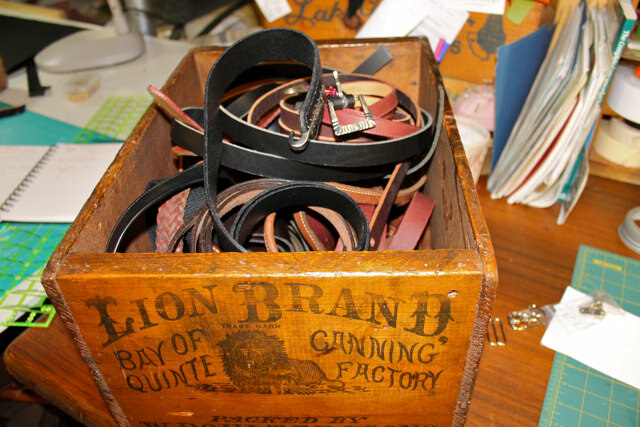 This version has a great vintage leather strap with a pewter buckle. It makes the bag unique. Standard 1510 features: large metal zipper pocket on the back of the bag for security, double leather bottom for strength, carry handle for versatility, adjustable straps, and easy drawstring closure under the flap. All the seams are double stitched. Under the flap is a great piece of dark brown upholstery leather. 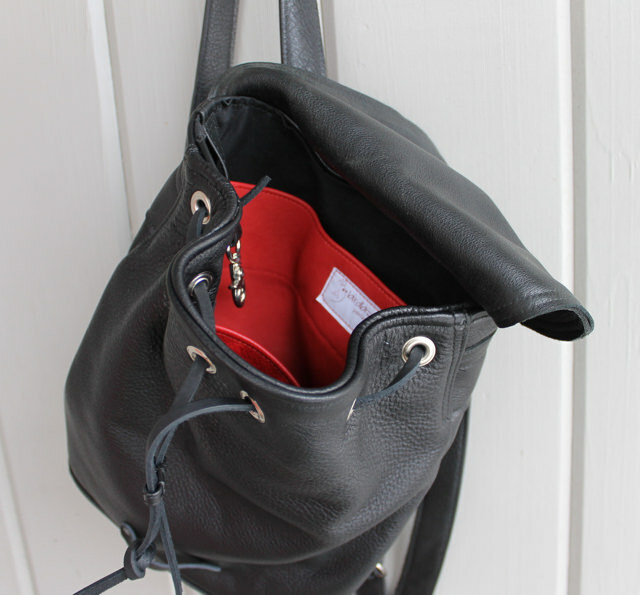 Inside the bag is lined in black waxed canvas with two leather pockets in red and pink–easy to see! 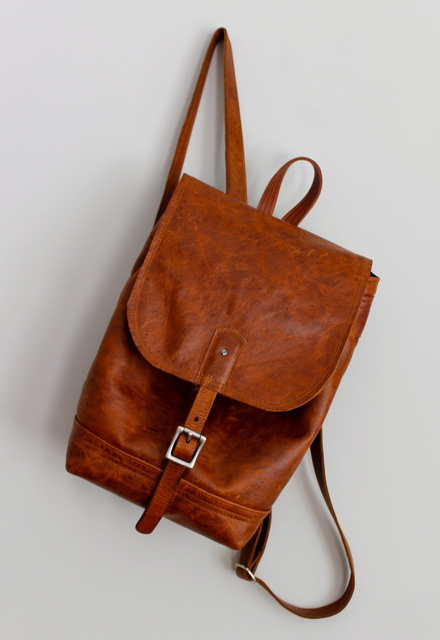 It’s made with great butterscotch leather with care and love. 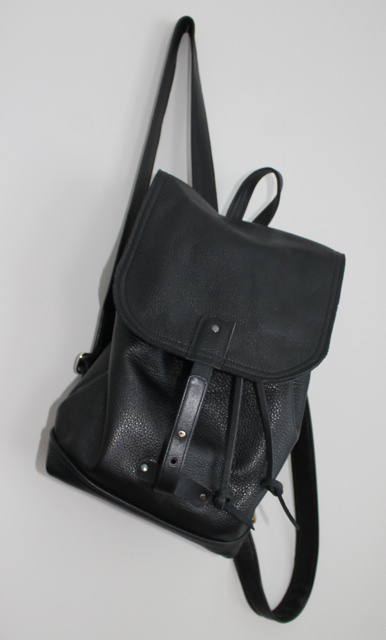 Another black 1510 backpack is ready to go. This one has all the features of the 1510 including the back pocket with zipper for security, the double bottom for durability, adjustable shoulder straps and a convenient grab handle. It secures with leather cords as well as a tab closure. 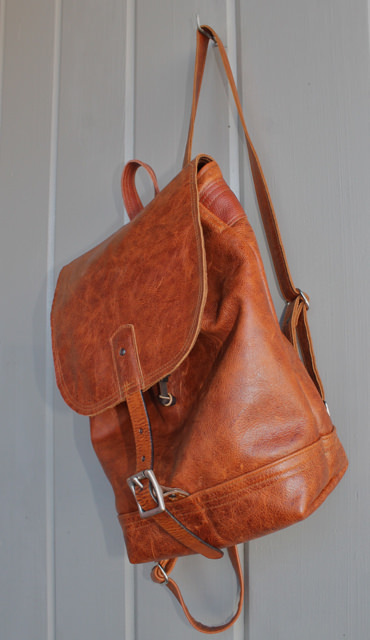 This is simply great leather with a polished look. Inside this one is lined in water-resistant black waxed canvas with two bright red leather pockets and a clip for your keys. 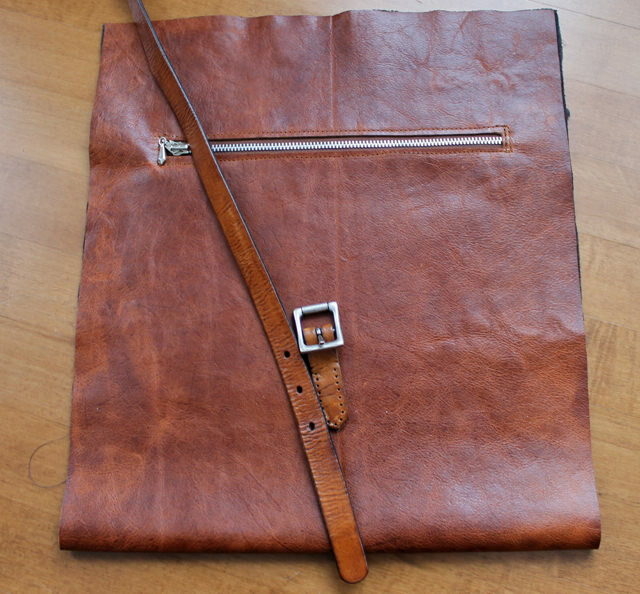 The leather under the flap is repurposed from a man’s jacket and the knob closure is from a vintage belt. Width 12″. height 13″ depth 4″. 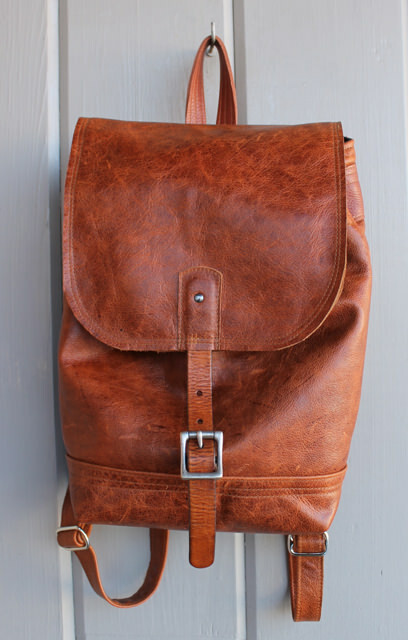 I’ll have another backpack in great cognac leather in the on-line store very soon. 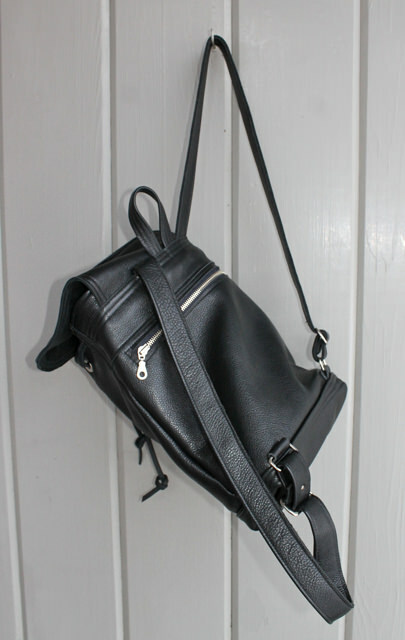 And if you are interested in a black one similar to this (with a different vintage closure) just let me know. Also in the works are a distressed cognac tote and a new small shoulder bag. I am hoping the latter part of January and February will be a productive period. 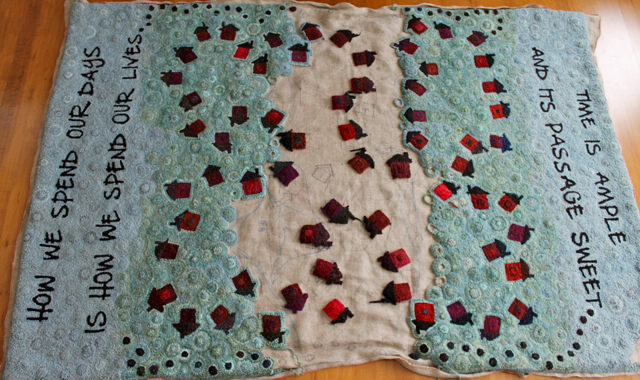 And I haven’t forgotten the Annie rug–hope to photograph this weekend. Thank you all for your interest. One of the things I promised myself that I would do this year was organize and reduce our sprawling book collection. I have already taken six bags to our local library with still more shelves to work on. Tucked away on one of the shelves was an inventory of historic Belleville houses, published in 1978 to commemorate the city’s centennial. This is a gem with lots of good information on 41 of the city’s old buildings. I’ve been thinking for some time about systematically sketching the lovely old buildings in my city which haven’t been the victims of the wrecker’s ball. I’d like to return to the ones I’ve tried earlier and strike out looking for new ones. 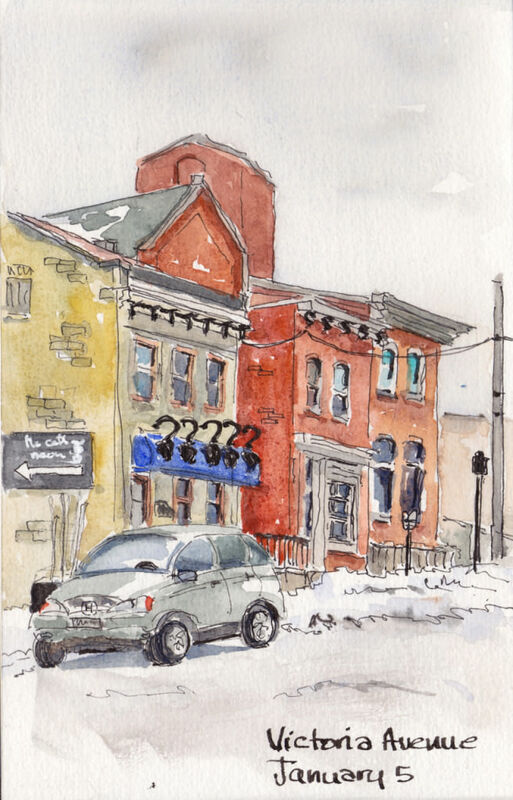 In the winter, I have to find ones that I can sketch from my car, or from a café window as it’s far too cold to sit outside, even briefly.This one is on Patterson Street, just beside my favourite townhouses, the Bellevue Terrace. I was able to sit in my car in a parking spot directly facing the front of this duplex. It is not featured in the inventory but I plan to go to the City Archives to learn its story. 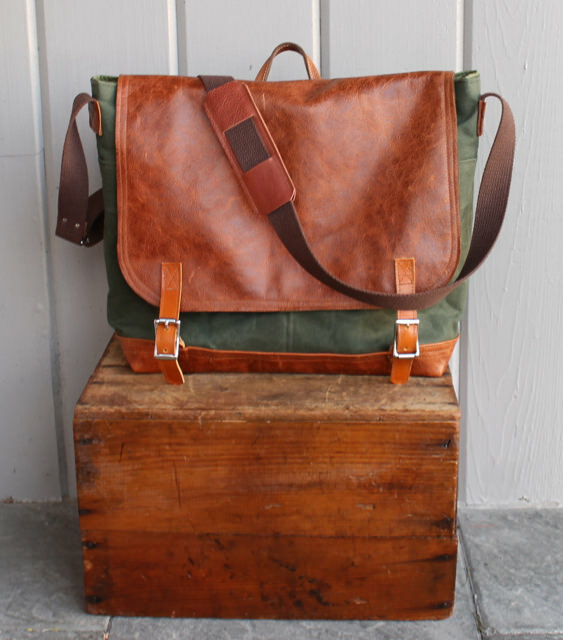 This new laptop bag is designed to fit a 15″ laptop and to be able to withstand the rigours of rugged travel. 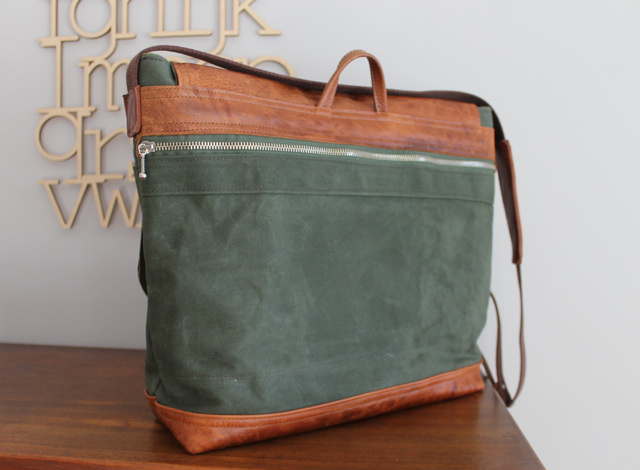 It is made of two layers of heavy moss Nairobi waxed canvas with caramel leather flap and details. All the seams are double stitched and reinforced. Overall dimensions: Width 18″ Height 13″, Base 4″. 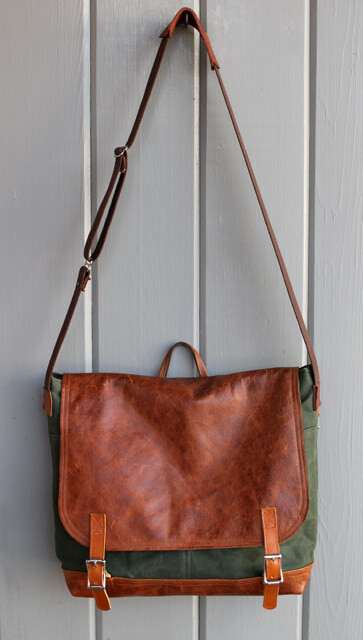 The bag has a very large zippered pocket on the back with a leather phone pocket tucked inside. On the front there are two large slip pockets under the flap. 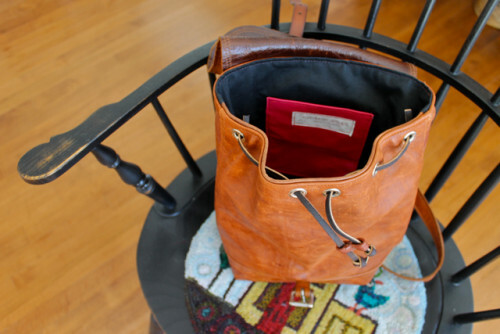 Inside there are more large slip pockets and a leather zippered pocket for valuables. The hardware, zippers and buckles are heavy-duty metal. The adjustable strap is brown cotton webbing with leather shoulder protector. 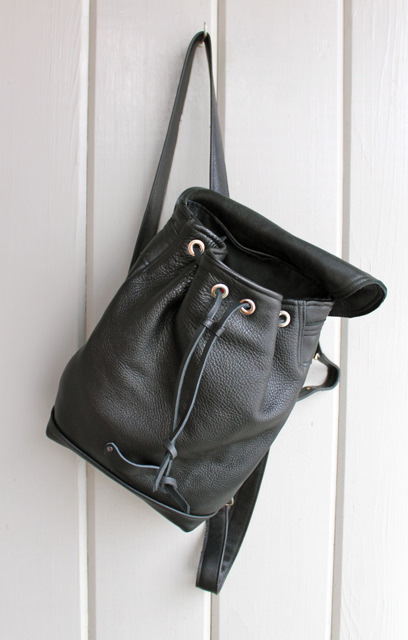 Small leather ties can be knotted to keep the bag secure under the flap. There is also a small carry handle repurposed from a vintage bag. 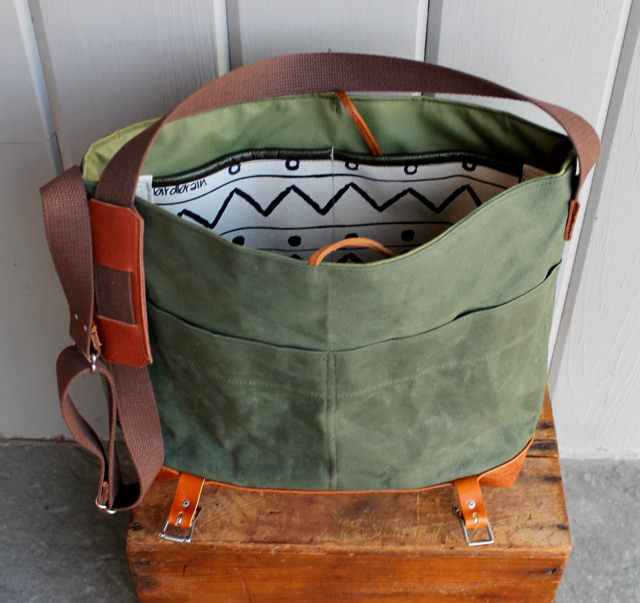 The bag is lined in water and stain-resistant fabric in moss green. 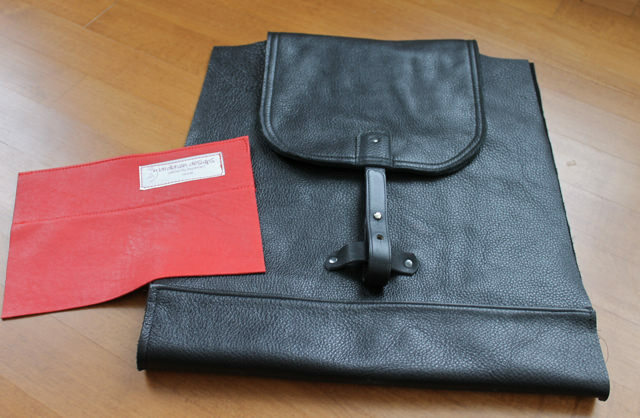 This photo shows the exterior and interior double slip pockets as well as the lining and the leather ties. 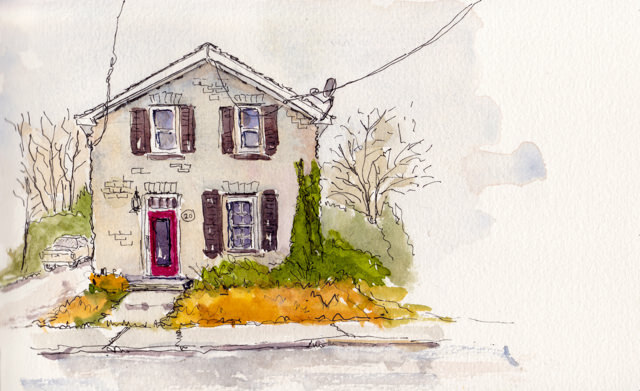 On Friday we had sun and I was able to park on an adjacent street facing the side of the Moodie Cottage and do this sketch. Around 1975 I lived in the little apartment on the back of the main house. This would have originally been the summer kitchen and sometime in the 1880’s or so had the Victorian clapboard second storey added. In the 70’s two local potters owned the house and fired up their kiln in the attached garage. 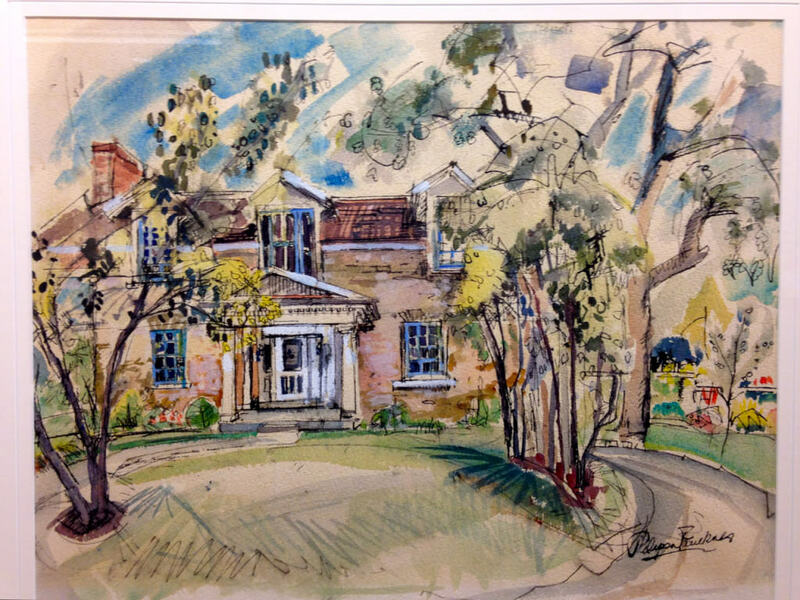 It was a pleasure for me to sketch this one-time home of mine and relive the memories. 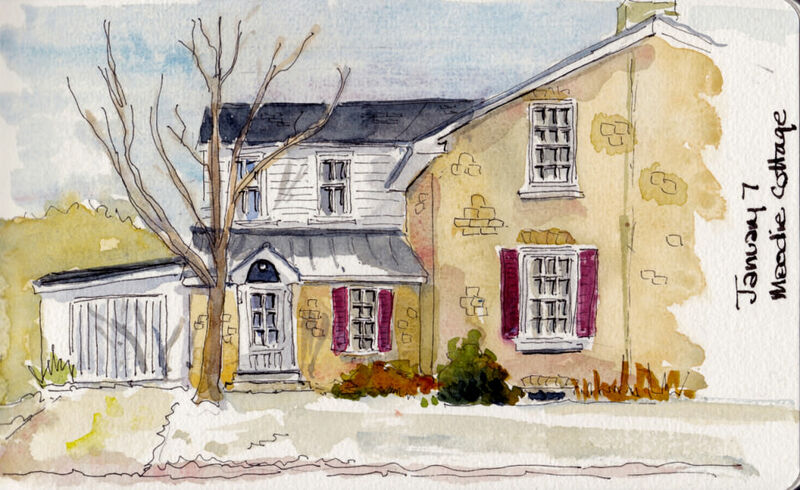 Below is another stone house in Belleville. It is one a row of three stone cottages on a side street in the city’s west end. Over Christmas I parked in front of this one and did this quick sketch. These were probably a group of workers’ cottages–the local sawmills and iron foundries would have been a source of employment from 1850 on. There is lots of information about the Moodie Cottage given its famous owner, but I can’t find anything on line about these three. I’ll try the County Archives and let you know. 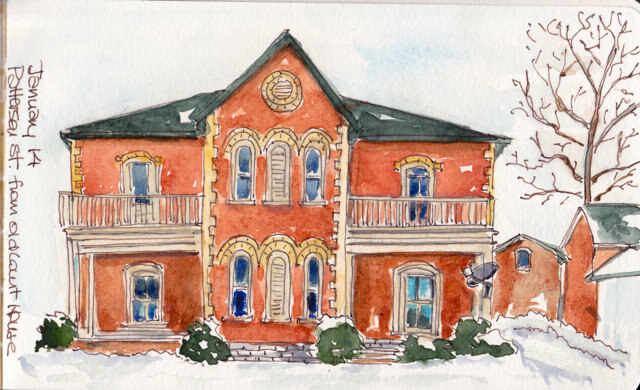 I’ve had the idea of sketching the local historic buildings for a long time and it seems 2016 will be the year. If you know anything about this one, I’d love to hear. These are three historic buildings just off the main street. I’ve been keeping an eye on them and last week had a chance to park in a good spot across the street at a time when they weren’t blocked by parked cars. I did this sketch in pencil in the car and then added ink and paint at home. I was intent on getting the cornices in place and managed to confuse the roof lines, putting the background church a more in the limelight than it really is.